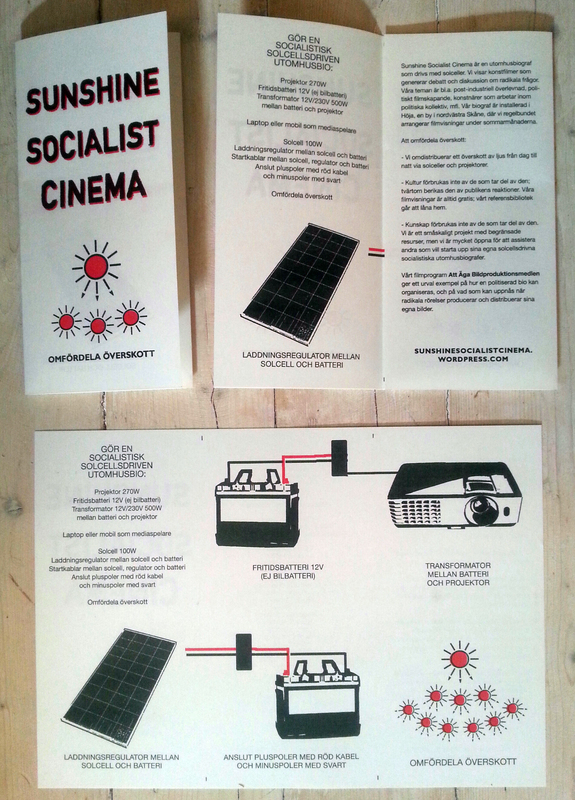 We are in the process of printing an illustrated manual, detailing the practicalities of constructing a solarpowered socialist outdoor cinema, for anyone interested in starting one. The manual will be published in a printed version and online as a PDF, in English at first but with several translations planned. Look for a Portuguese version in the summer and a Spanish version in the fall. The printed manual will be distributed at our screenings, and given away for free to anyone genuinely interested in the subject. It will be printed on a Riso, in soy-based colors (black and red), and we’re aiming for 40 pages. As a first try, we’ve already printed and shared a folder, The Re-distribution of Surplus. It’s in Swedish, folded A4, printed in soy. There are still a few copies left, available at our screenings.